https://sep.yimg.com/ay/yhst-33477391359232/powder-blue-tang-acanthurus-leucosternon-powder-blue-surgeon-fish-9.jpgPowder Blue Tang - Acanthurus leucosternon - Powder Blue Surgeon Fish ModerateAggressive100 Gallon9.1 inchesYesHerbivore, Greens, Pellet, FlakeTropical Indo-PacificAcanthuridaeSmall 1" - 2"
The Powder Blue Tang is a tropical fish, is light blue with yellow and white highlighted fins. It has several varying shades of blue accented by yellow and white. To top, dorsal fin will be a very bright yellow and there will be some yellow at the base of the pectorals fins as well. The anil and ventral fins will be white and the caudal fin will be white with its edges outlined in black. The base of the caudal will be yellow as well. This is also the location of the sharp boney spine. 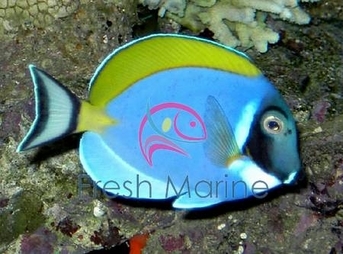 The Powder Blue Tang face is a uniform black with a white outline. The fish doesn't undergo color changes as it matures as some tangs, surgeonfish and unicornfish do. A healthy Powder Blue Tang have a plump body and should not have a noticeable lateral line. The colorations should be very bold and the area behind the eyes should not be depressed. The Powder Blue Tang have alimentary faunas (bacteria living in their stomachs). It is recommended that treating with a copper based treatment be either avoided or be performed in as short a time period as possible to keep from damaging this faunas population. Fenner speculates that excessive treatments with a copper medication could lead to mysterious deaths of tangs in the Acanthurdis class. The Powder Blue Tang is uncommonly harvested for anything other than the marine aquarium industry. It is a commonly sold fish that is moderatly difficult to care for, although it's popularity is easily exceded by the Blue tang and Yellow Tang. Maximum size: The Powder blue Tang grows upto 9 inches. General size: This fish generally comes in size of 3 to 4 inches. Habitat: The Powder blue Tang�s natural distribution is in the Indian Ocean in clear reef settings, from Indonesia and Christmas Island westward to eastern Africa to the Andaman Sea. Feeding and Diet: The Powder blue Tang, like most in the Acanthuridae family eats is herbivorous eating mostly benthic algae.